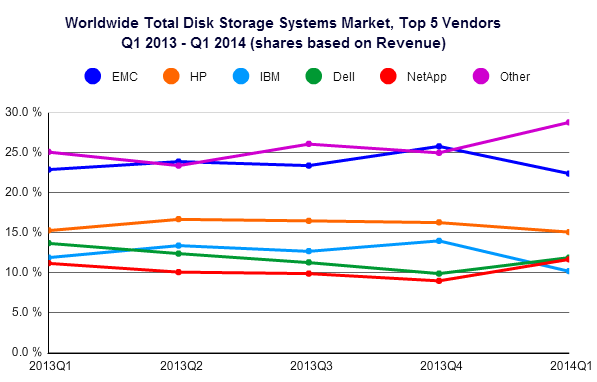 The market for computer server disk storage systems has had its ups and downs. The current downward trend is partly due to the effective use of virtualization software and the adoption of public cloud computing services -- whereby, the resulting IT operational efficiency has the effect of reducing hardware demand. Worldwide external disk storage systems factory revenues fell -5.2% year over year to $5.6 billion during the first quarter of 2014 (1Q14), according to the latest global market study by International Data Corporation (IDC). For the quarter, the total (internal plus external) disk storage systems market generated $7.3 billion in revenue, representing a decrease of -6.9 percent from the prior year's first quarter and a sequential decline of -17 percent compared to the seasonally stronger 4Q13. Total disk storage systems capacity shipped was 9.9 exabytes, growing just 19.9 percent year over year. "The poor results of the first quarter were driven by several factors, the most important of which was a -25 percent decline in high-end storage spending," said Eric Sheppard, research director at IDC. Other important contributors to the market decline include the mainstream adoption of storage optimization technologies, a general trend towards keeping systems longer, economic uncertainty, and the ability of customers to address capacity needs on a micro and short-term basis through public cloud offerings. EMC was the largest supplier, but experienced a year-over-year share loss during the quarter. The company captured 29.1 percent of the external disk storage revenue during the quarter, which was down from 30.2 percent the year prior. NetApp was the second largest supplier in the market with 15.1 percent share of external revenue (up from 14.8 percent in 1Q13). HP, IBM, and Hitachi finished the quarter in a statistical tie for the third position with shares of 8.8, 8.8 and 8.7 percent respectively. Dell was the sixth largest supplier of external storage, generating 7.3 percent of the revenue during the quarter. The total open networked disk storage market (NAS Combined with non-mainframe SAN) fell -3.9 percent year over year to $4.9 billion in revenue. EMC maintained its leadership in the total open networked storage market with 31.5 percent revenue share, but lost share compared to the 33.4 percent the company generated in 1Q13. NetApp was the second largest supplier with 17.3 percent share, followed by HP (8.9 percent), IBM (8.6 percent), and Hitachi (8.3 percent), all of whom tied for third place.